"Combining Indian and Asian ingredients, these are some of the best pork chops we've eaten!" In a bowl, stir together soy sauce, lime juice, garlic, and ginger. 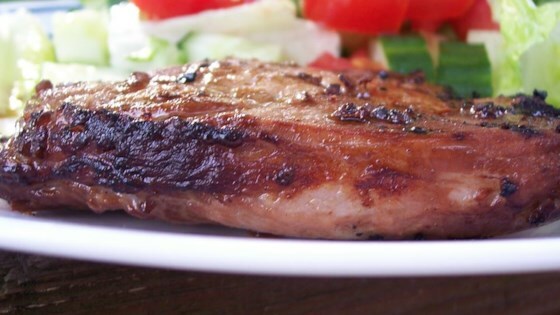 Place pork chops in a glass dish. Pour soy sauce mixture over chops. Cover, and refrigerate 2 to 3 hours, turning occasionally. Preheat an outdoor grill for direct heat and lightly oil grate. Place chops on the grill. As they cook, sprinkle with garam masala. Cook about 10 minutes on each side. Didn't have garlic or ginger paste so I used minced fresh garlic & shredded fresh ginger + fresh squeezed lime juice, etc. Good flavor, moist and delicious, will make again. these were good. Interesting flavor but didn't blow me away. This is an excellent marinade recipe - my chops were tender & delicious - my whole family loved them! I can't wait to try it on pork tenderloin, too. These were different and good. Next time I'd probably add a little olive oil to the marinade as pork chops dry out so easily.